According to the police report obtained by the Daily Caller Foundation, an anarchy symbol was spray painted on Carlson’s driveway. His oak door was also broken by the militant leftists. Carlson was not home at the time of the incident, but his wife was there alone. She hid in the pantry in fear as the mob banged on her door shouting threats. Luckily, their four children were not at home. “Someone started throwing himself against the front door and actually cracked the front door,” Carlson told The Washington Post. Videos of the incident were posted by Smash Racism DC, a DC Antifa group that has now been suspended from Twitter. “It was discovered that unknown persons spray painted an anarchy symbol on the driveway. There were also signs left on the vehicles parked in the driveway as well as a sign left on the front door of the home,” the police report states. The co-founder of the group that organized the protest, Mike Isaacson, previously appeared on Carlson’s show. At the time, he was a professor at John Jay College, but was fired after his tweets promoting violence were uncovered. He claims that he is no longer affiliated with Smash Racism DC. The group dispersed within minutes of police arriving on the scene and no arrests were made at the time. Hours after the incident, DC Antifa groups published a document containing the home addresses of Tucker Carlson and his brother Buckley Carlson — along with the addresses of Ann Coulter, Daily Caller’s Neil Patel, and Sean Hannity. “So, we will go to their homes and their workplaces, and find them in restaurants. We invite others to do the same! Get creative!” Smash Racism DC urged their readers. 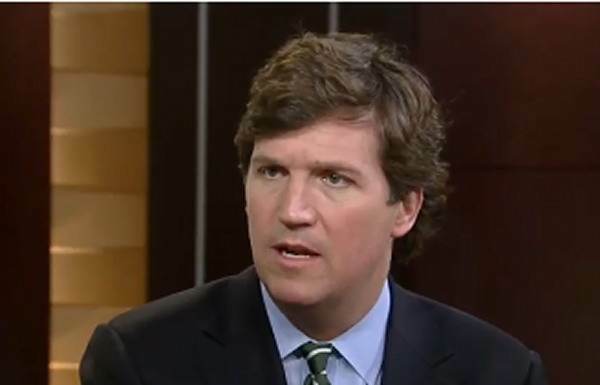 The post UPDATE: Antifa Mob Vandalized Tucker Carlson’s Home, Car, Driveway, Door – Police Investigating as Suspected Hate Crime appeared first on The Gateway Pundit.